Output Type - 6 pt. Overall Length - 1-3/4 in. 1/2 in. Drive SAE Impact Sockets are ideal for use on stubborn or damaged fasteners and on fasteners made from soft materials. TorquePlus models allow for quick and easy socket engagement to the fastener flats, not the corners. 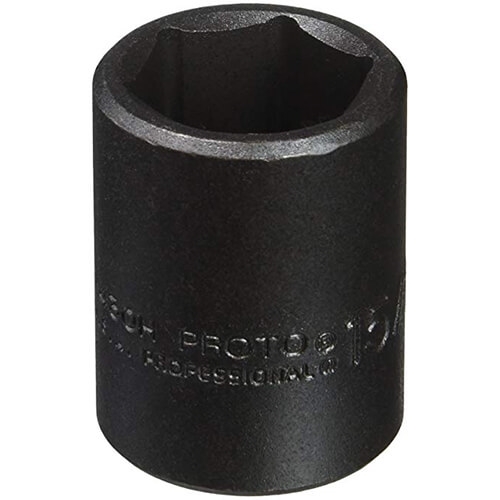 The radius-corner design helps shift contact area and stress away from the fastener corners to distribute contact stresses over a large area of the socket, minimizing slippage. The internal design minimizes fastener rounding and allows the user to easily turn worn, rounded or rusted fasteners. ProtoGrip Magnetic Sockets employ high-strength magnets and require no bushings to hold magnets in place. They are designed to easily pick up heavy fasteners and hold them during use.